Falcunculus gutturalis Vigors and Horsfield, 1827, Bass Strait. Two subspecies. French: Carillonneur huppé; German: Haubengudilang; Spanish: Campanero Crestado. 8.3-9.1 in (21-23 cm); 0.13-0.15 lb (57-67 g). 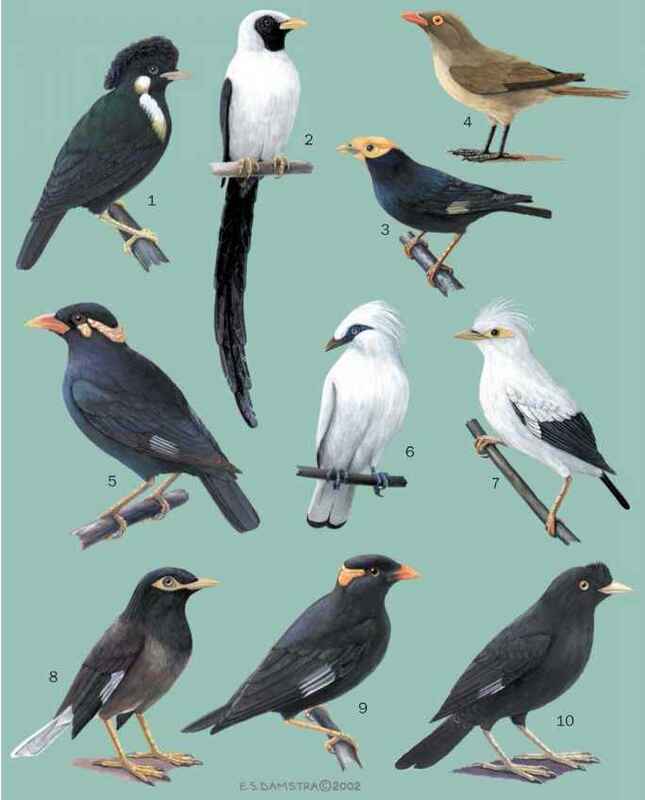 Brownish up-perparts with white around bill, black crest tip and breast, and buff belly. 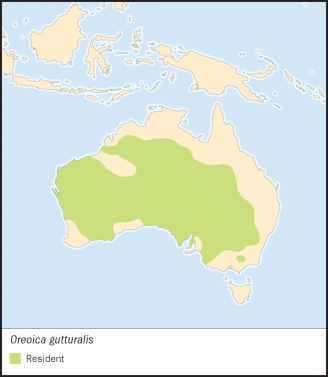 O. g. gutturalis: South, southwest and inland southeast Australia; O. g. pallescens: northern, west central, and central Australia. Arid inland and coastal woodlands and scrubs. Sedentary or locally nomadic in more arid areas. Territorial through year, rather solitary except when breeding. Unobtrusive, keeping to cover, except when male sings from elevated perch. Unusual and distinctive song consists of two slow, then three fast ringing notes, reminiscent of a cowbell; has a ventriloquial effect, making the singing bird difficult to locate. Breeding season August-January, usually earlier in south, later in north, and often opportunistically in more arid regions. Depending on conditions, a second brood may be raised. The nest, a deep cup of bark strips, short twigs, leaves, and grass, is placed in fork, on top of broken stump, or in dense shrub, 3.3-10 ft (1-3 m) from ground. An odd and unexplained habit is the placement of paralyzed caterpillars around rim of the nest during incubation. The two to four eggs are pale bluish white with black, brown, and lavender-gray blotches. Both sexes incubate (14-17 days). Fledging period 11-12 days. Common in interior, decreasing towards coastal districts and more humid regions, populations may be contracting in some regions.